SPRING GROVE, Ill. (WLS) -- A family farm in northern Illinois has finalized plans for its 2017 corn maze. It will celebrate a win 108 years in the making. The Richardson Adventure Farm in Spring Grove will honor the Chicago Cubs' historic World Series win with this year's maze. 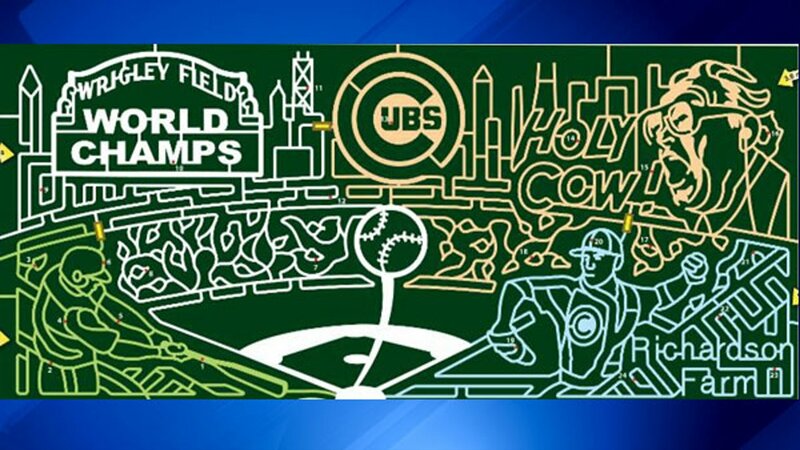 The elaborate, 28-acre maze will feature the Wrigley Field marquee, the Chicago skyline, a batter, a pitcher, the outfield ivy and Harry Caray proclaiming, "Holy Cow!" Richardson Adventure Farm opens for the season on Sept. 2.